An Internet connected home/home office network, consists of a variety of hardware and software components. In this tutorial we look at the various components that you need to create a computer network and connect it to the Internet. The technologies, components and services used in small home networks are the same (function wise) as those used in large corporate networks. 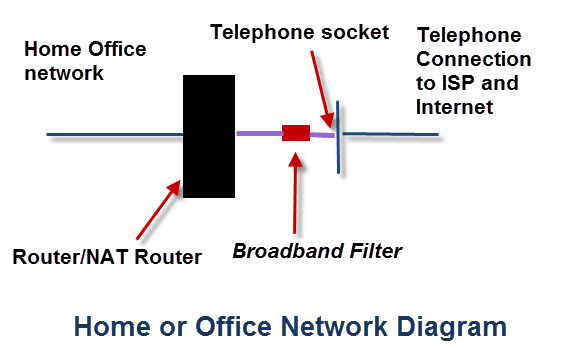 The diagram below shows a typical home or small office network layout. This converts digital signals into analogue signals that are suitable for sending over a telephone line. 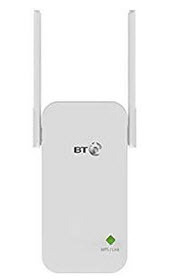 It is usually built into the Internet/broadband router and not normally purchased as a separate component. Used to filter out DSL signals from telephone signals so that you can access the internet and use the telephone simultaneously. A firewall functions like a router except that it blocks traffic from the external network according to user configured rules. A firewall protects your home/small business network computers and devices from intruders on the Internet. 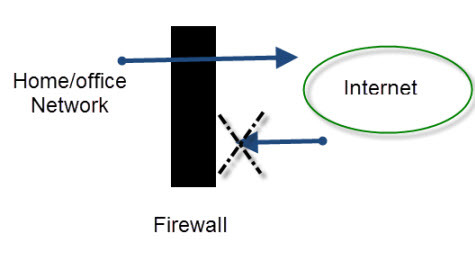 Small networks use a firewall/NAT router combination in which a single device acts as a NAT router and firewall. NAT effectively isolates your home network from the Internet. See Port forwarding and Internal and external IP Addresses. 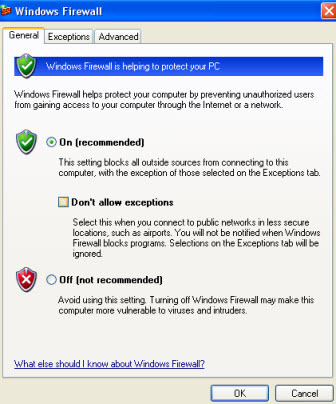 If you are using Windows XP (or above) then you also will have firewall on your computer. This firewall is less secure than the one built into your router/hub but it is normal to leave it enabled on your computers. When you install applications e.g. Skype you will find that they change the firewall settings. Here is a short video explaining how the computer firewall works. Internet connection sharing allows you to share an Internet connection with other computers on a Local/home Network. It requires that one computer be designated as the sharing computer (the computer with the Internet connection). 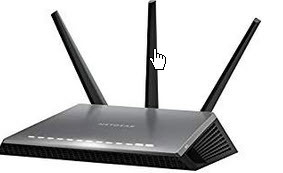 This computer functions effectively as a NAT Router, and must be left switched on for the other computers to access the Internet. This configuration is not normally used anymore. Hubs,bridges and switches are all devices used to connect computers and other devices together on an Ethernet network. A hub connects two or more computers together (like switch in diagram above). Hubs are effectively multi port repeaters and operate at the physical layer (level one). They do not examine the network traffic. They are being replaced today by the switches. Smallest is usually 4 port. A bridge connects two network segments together and is a selective repeater. It examines the MAC address of the traffic it sees and learns which network segments contain the various MAC address. It uses this information to decide whether or not to repeat the traffic on a network segment. A Bridge works at level 2 (data link Level) and will transmit broadcasts. A switch Connects two or more computers together and used today in preference to a hub or bridge. 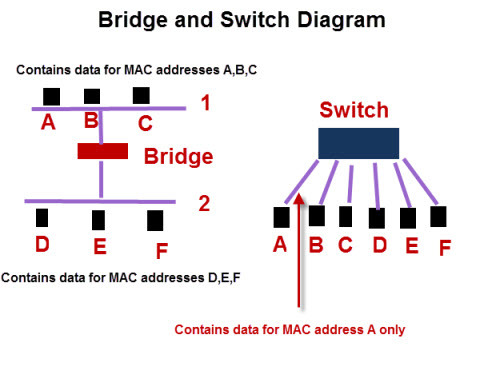 Like a bridge a switch learns about MAC address connected to each port and will only send data on that port that is addressed to those MAC addresses. A switch is effectively a bridge with more ports. A wireless access point connects wireless devices to an Ethernet network, and to each other.It effectively does the same job as a hub/switch but for wireless devices. A router connects networks together. Routers operate at the networking level of the TC protocol stack. Most home routers provide both Wi-Fi and Ethernet connections. Home routers also provide NAT (Network Address translation) services. They are also commonly known as hubs but this doesn’t actually describe their networking role. Place in range of the existing Wireless network, and it will take the signal from the network and rebroadcast it, thus increasing the range of the network. Modern ones plug directly into a mains socket and require no other connections. 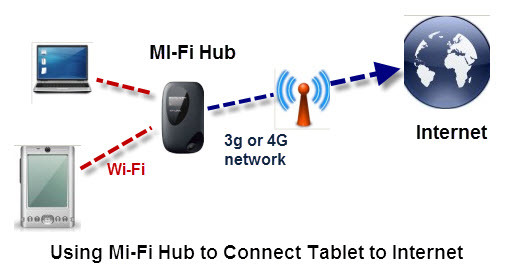 A Mi-Fi Hub is a relatively new device, and it can be used for connecting multiple devices to the Internet over the mobile network (3g and 4G). Your devices connect to the hub using Wi-Fi and the Hub connects to the mobile network using 3G/4G . Mi-Fi hubs are low cost ( around £20 to £40) and many will work hours without being connected to the mains. These are Ethernet cards that plug directly into a mains socket, and use the mains wiring to carry the Ethernet signal instead of using UTP cable. You can also get ones that function as Wireless Access points which are used for extending a networks to overcome range limitations of Wi-Fi. See Homeplug adaptors and Powerline networking and extending a home network. Common cable for connecting Ethernet devices together.Ranges from cat5 to cat6. Older Installations will use cat5 and newer ones cat6, which is designed for higher speeds. Here is a good video covering the differences. Wiki On cat6 cable and cat 5. Used to connect two computers together without requiring a hub/switch. It is also used for connecting older hubs/switches in cascade. Not normally required today as the newer hubs/switches use auto detect and can switch modes. Low cost and very useful for joining Ethernet cables together. Simply Plug an Ethernet cable into each socket. How to wire your own home network PCworld tutorial and This video . Just having computers connected together by WI-FI or Ethernet is the first step. To exchange information they require to have, and use several networking services and protocols. All modern networks use the IP networking protocol, and to work on a network all devices require an IP address. There are two versions of the IP protocol currently in operation. IPv4 is the original version and is deployed in all home and office networks and on the Internet. IPv6 is being rolled out and many new networks and network devices support it, but it isn’t used as the default protocol. DHCP is a service and protocol that requests and assigns IP addresses to computers automatically. All modern computers,tablets and smart phones are capable of using DHCP and are configured to use it by default. For home and small office networks the DHCP service is built into the router that connects to the Internet. For larger office networks this service is configured on a network server. If no DHCP service is available clients will automatically assign their own IP address (known as a local address) or you can manually assign them( called static addresses). The domain name system is the heart of the Internet. It is responsible for resolving domain names to IP addresses. Without DNS you would have to remember the IP address of each website that you visited. All networking clients (PCs,tablets,Phones) function as DNS clients and have the necessary software built in so that they can use DNS. The DNS servers store the data and are mainly located on the Internet e.g. 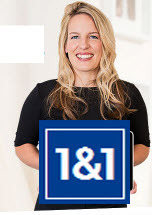 your ISP (internet service provider,Google etc). Large companies will use their own DNS servers locally. To use DNS the client will need to know the address of a DNS server. This is normally assigned by the DHCP server. DNS is crucial to the Internet and search engines are crucial for the Web. Browser displays content from website. MAC Address – The 64 bit Physical address of the device which is assigned to the Wi_fi adapter or NIC. Cannot normally be changed. UTP- (Unshielded twisted pair)- Common cable for connecting network devices. RJ45- Connector used for connecting Ethernet devices. RJ11- Connector used for connecting telephones,modems etc in USA and adopted in other countries. Gateway – A gateway works at the application level of the TCP/IP protocol stack and does a translation. Examples are email to FAX gateways. On earlier networks and in earlier networking courses routers were called gateways, and the term is still used when setting up networking clients. In this context the term gateway refers to the gateway to an external network i.e. the Internet. Uni-cast Message – Message sent from one device to another. Multicast Message -Message sent from one device to several others.